The Professional Portfolio helps members maintain professional excellence by promoting ongoing self-reflection and development. Every Practising member must maintain a Professional Portfolio in order to set measurable goals toward continuous quality improvement and enhanced professional practice. Completion of the Professional Portfolio is self-declared during the annual registration renewal. Random audits of portfolios are conducted throughout the year. Quality Assurance staff email every Practising member the instructions to access and maintain their portfolio. Please note that the email is sent to the member’s preferred email address from their CMLTO member profile. It is important that you keep this email to enable you to continually update and maintain your portfolio throughout the year. If you require any assistance with your Professional Portfolio, please do not hesitate to call or email our Quality Assurance staff. These resources were developed to help MLTs complete their Professional Portfolios. Answer: The Professional Portfolio audit process is described below. Members are randomly selected annually from the membership database to complete the Professional Portfolio audit. Members are notified by mail and email that that they are required to submit their Professional Portfolio. The notification includes detailed instructions to access and complete their portfolio audit submission. In preparation for the audit, members should review the Professional Portfolio guidance documents. Members may update and submit their Professional Portfolio any time prior to the notification deadline. A Quality Assurance Program (QAP) staff member will review your professional portfolio audit submission. If further information or clarification is required, QAP staff will contact the member via e-mail or telephone. When the Professional Portfolio review is completed, QAP staff will e-mail a summary report to the member. Members are encouraged to complete the anonymous Professional Portfolio feedback survey. Member feedback enables the CMLTO to continuously improve the QAP. All successful members are mailed a Quality Assurance Program pin in recognition of their achievement. 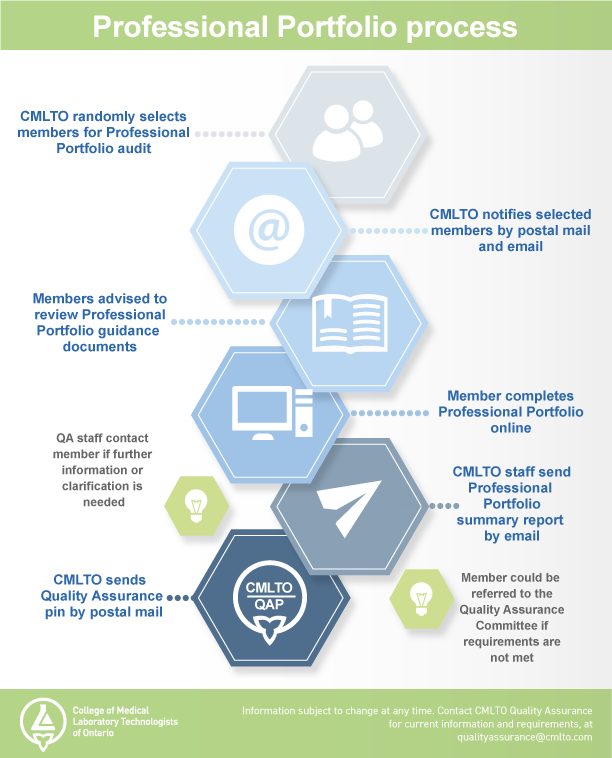 If a member submits an incomplete Professional Portfolio audit, or they do not respond to communications from the CMLTO, their file is referred to the Quality Assurance Committee for review. Answer: The program is mandatory for all CMLTO Practising members, regardless of employment status. Answer: Members are randomly selected annually from the membership database for Professional Portfolio audit. All members who have held a Practising certificate of registration for 12 months or more are eligible for Professional Portfolio audit. Members who have already been selected for Practice Review in the same calendar year are excluded. Question: How often should members complete their Professional Portfolios? a record of their 30 hours of professional development. The portfolio supports members in their ongoing self-reflection and development. During the annual renewal process, members declare that their Professional Portfolio is up-to-date. Answer: The Professional Portfolio audit directs members to submit their self-assessment, set goals, and complete and record a minimum of 30 hours of activity focussed on new learning. The Practice Review audit directs members to answer 25 case study questions focussed on the learning modules presented on the CMLTO website. This audit is an online assessment. Question: How long do members have to retain their professional development records? Answer: It is recommended that members keep their professional development records for the previous two calendar years. Question: What if I don’t have enough hours to report for the Professional Portfolio? Answer: CMLTO Quality Assurance Program staff will provide guidance in order to help the member attain the hours they require for the Professional Portfolio. In some cases, a member’s file may go before the Quality Assurance Committee (QAC) for further recommendations and actions.